Up early, train to Cambridge, met a number of ARM guys on their way to FOSDEM on the train to London; met Tim and Zaheda on the Eurostar, slogged away at typing slideware much of the journey. Arrived and got to the Astrid, checked in, partner call with JP & Curtis, rushed to GNOME AB meeting - lots of good things going on there, most encouraged by gtk+'s continued support of multiple platforms. On to two dinners back-to-back, met up with lots of lovely Free Software-ites; then the LibreOffice hackers. Up hyper-late hacking on slides, and catching up with the guys. Up early, mail chew, pre 4.2 rush; off to the dentist, back - tried to avoid chewing on self variously. Lunch. Waded through twitter E-mail on the 4.2 release, and encouraging ODF / LibreOffice goodness in the UK. ESC call, getting prepped for FOSDEM, UX hack-fests etc. 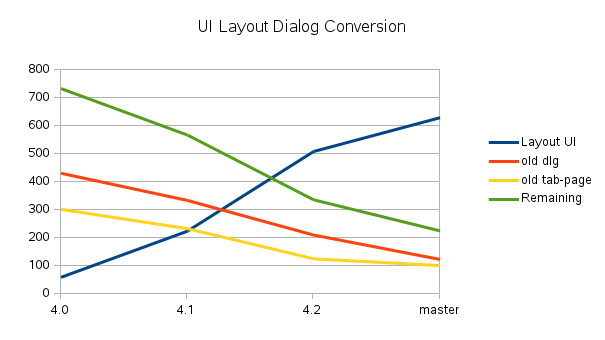 The UI migration to Glade layout based XML files continues apace with contributions from many individuals, we managed to convert another 280 dialogs in this release, getting us around 70% of the way there. Many thanks to: Caolán McNamara (Red Hat), Manal Alhassoun (KACST), Olivier Hallot (EDX), Faisal M. Al-Otaibi (KACST), Laurent Balland-Poirier, Efe Gürkan Yalaman, Krisztian Pinter, Jan Holesovsky (Collabora), Andras Timar (Collabora), Cao Cuong Ngo, Gergo Mocsi, Katarina Behrens, Abdulmajeed Ahmed (KACST), and Alia Almusaireae (KACST). Thanks also to our translators who helped in the migration of strings. If you'd like to get involved in driving this to 100%, checkout Caolan's howto and updates. Is enough to get a fully working suite on Windows, Mac or Linux. That avoids a ton of perl, cleans up a lot of scp2/ and includes removing a chunk of install-time setup. Thanks to Michael Stahl (Red Hat), David Tardon (Red Hat), Matus Kukan(Collabora) and Marcos Paulo de Souza. It's always fun to see partners exchanging runnable Windows installs as an instdir.zip. As an added bonus we also removed some vile platform specific sub-directories from the build infrastructure things like unxlngi6.pro all over the place; if people want to build multiple platforms from the same source they can run configure from a separate directory. Thanks to Michael Stahl (Red Hat), and Tor Lillqvist (Collabora). Building the large number of localisations that go with LibreOffice - we support 100+ languages out of the box creates quite a compile-time load. Thanks to Bjoern Michaelsen (Canonical) - we can now compile localisation separately from the main package. This helps Linux packagers in multiple ways. The split lowers the requirements for disk space on the build machine (which can be over 25 GB for a release build), which is helpful for porting to more constrained architectures. Builds and respins are faster. With the in-place runnable LibreOffice build into instdir we can also avoid using crufty scp2/ macros interpreted by perl to package these directly. The change also makes it easier to re-spin security fixes without re-building hundreds of unchanged localizations, we look forward to Linux distributions picking this up to ease their packaging and maintenance burden. For many years, horrible hacked version of ... now thanks to Michael Stahl (Red Hat)'s great work doxygen has been taught about LibreOffice's UNO IDL and we've rid ourselves of the cosv, udm and autodoc top level modules - good riddance to 57k lines of code. Thanks also to those who helped to improve, cleanup and 'doxygenize' code comments in 4.2 Julien Nabet, Miklos Vajna (Collabora), Christian Lohmaier (TDF), Thorsten Behrens (SUSE), Stephan Bergmann (Red Hat), Zolnai Tamas (Collabora). You can read our generated documentation for: public API and internal API here. There has been a lot of work on code quality and improving the maintainability and cleanliness of the code. 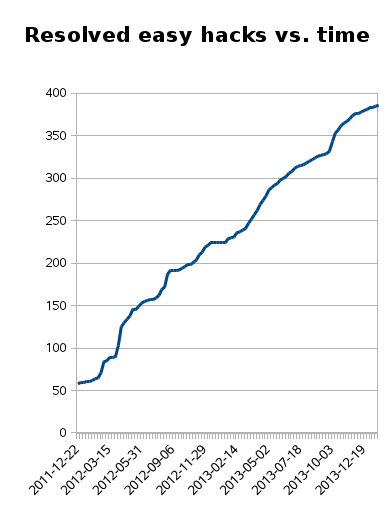 Another 80 or so commits to fix cppcheck errors thanks to Julien Nabet, the daily rumble of building without any compile warnings with -Werror -Wall -Wextra on each platform with thanks primarily to Tor Lillqvist (Collabora) and Caolán McNamara (Red Hat). Thanks to Markus Mohrhard we have the successful import crasher tests, that now test 45,000+ problem / bug documents from bugzillas across every project we can get our hands on. We load them one by one in a build with paranoid debugging assertions turned on. In recent times, we've also started exporting these documents to multiple different file formats looking for export issues, then, subsequently running whatever validation tools we can on the output. That, over time has a great impact on quality. Output is logged by git hash. Valgrind continued to be a wonderful tool for finding and isolating leaks, and poor behavior of various bits of code. Thanks to Mark Wielaard for fixing a number of leaks and other problems here, along with many other of the usual suspects. We also built and executed more unit tests with LibreOffice 4.2 to avoid regressions as we change the code. These are rather hard to measure, since people like to pile up new tests inside existing unit test modules. 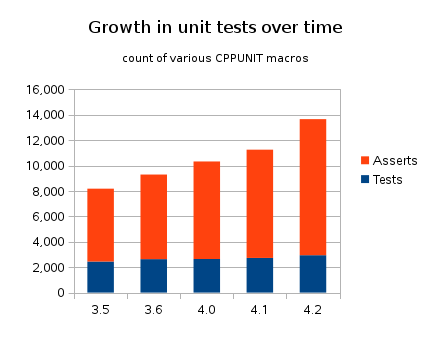 One simple measure is to grep for the CPPUNIT_TEST() registration macro we can see that we added 216 of these since 4.1 - but we also added more CPPUNIT_ASSERTs per test; over 2160 of these. Our ideal is that every bug that is fixed gets a unit test to stop it ever recurring. With over 80 committers to the unit tests in 4.2, it is a little difficult to list everyone involved here, but it's wonderful to have a firmly entrenched and growing culture of writing unit tests alongside fixes. This release the QA team has grown, and done some amazing work both triaging bugs, and also closing them. Thanks to Bjoern Michaelsen (Canonical), Robinson Tryon and Joel Madero for doing some great work there - and particularly to our top bug fixers, there is a great list of people responding in bugs here. One metric we watch in the ESC call is who is in the top ten in the freedesktop Weekly bug summary. Here is a list of the top twenty people who have appeared most frequently in the weekly list of top ten bug closers; thanks to them tommy27, Caolán McNamara (RedHat), Maxim, Jean-Baptiste Faure, Eike Rathke (RedHat), ign_christian, Foss, Urmas, Joel Madero, Cor Nouws, Julien Nabet, Michael Stahl (RedHat), Maxim Monastirsky, Jorendc, Andras Timar (Collabora), Lionel Elie Mamane, Kohei Yoshida (Collabora), mariosv, bfoman, Thomas Arnhold, Adolfo Jayme (fitoschido), Sophie (TDF), Samuel M., Markus Mohrhard (Collabora), Rob Snelders. You can read more about bug statistics and background on Bjoern's (interesting) blog (with cats). The overall bug picture can be summarised with some thousands though. QA triages incoming bugs, testing and confirming that the bug is reproducible, providing good information and keeping the flow of un-triaged bugs down. It's easy to get involved and help out with this here. Each release QA finds and marks around one thousand duplicate bugs. Each release QA closes around one thousand issues as invalid (for various reasons - eg. no NEEDINFO response in months). Each (six monthly) release the developers fix around one thousand bugs. Each release the number of 'new' bugs grows a little, but that rate is slowing. Currently we have around 25k bugs of which 6.5k are 'NEW' and ~800 are 'UNCONFIRMED'. However, around 25% of our bugs are feature requests - to which, there is (presumably) no end. The trend in open most annoying bugs and those tagged 'regression' are flat, while fixed versions of both grow rapidly. Perhaps the largest single change in 4.2 which has been underway from the very beginning of the LibreOffice project is removing our obsolete tools/ string class - thus leaving us with only 2x string classes, one for arbitrary encoding 8bit strings, and another for UTF-16 strings. The final commit slayed this monster for good. But of course huge numbers of people have worked hard at this job and associated cleanups for several years now - in this release around thirty people lent a hand; thanks particularly to Noel Grandin for spearheading the work, but also to many others Matteo Casalin, Caolán McNamara (Red Hat), Stephan Bergmann (Red Hat), Ivan Timofeev, Michael Stahl (Red Hat), Thomas Arnhold, Kohei Yoshida (Collabora), Eike Rathke (Red Hat), Tor Lillqvist (Collabora), Palenik Mihály, Markus Mohrhard (Collabora), Luboš Luňák (SUSE), MÁTÉ Gergely, Andrzej J.R. Hunt (Collabora), Christina Rossmanith, Laurent Balland-Poirier, Julien Nabet, Sean Young, Neil Moore, Jelle van der Waa, Donizete Waterkemper and Arnaud Versini. Finally in 4.3 we will have the first user visible benefit of this work, allowing more than 64k characters in a single paragraph, checkout our still nascent 4.3 features wiki page and a related blogpost. Beyond that, fixing a bug recently it was somewhat interesting to see the morass of string types in the Windows platform. We have a number of APIs for handling temporary files with different pedigrees, the oldest and ropiest: tools/tempfile.hxx was kindly written out by Palenik Mihály. Ideally there would be just one (safe) place in sal/ where temp files are handled. We continued to make some progress on translating our last lingering German comments across the codebase to good, crisp technical English. Many thanks to Philipp Weissenbacher, Philipp Riemer, Laurent Balland-Poirier, Rolf Hemmerling, Chris Hoppe, Rodolfo Ribeiro Gomes, Matthias Freund and Henning Diedler. 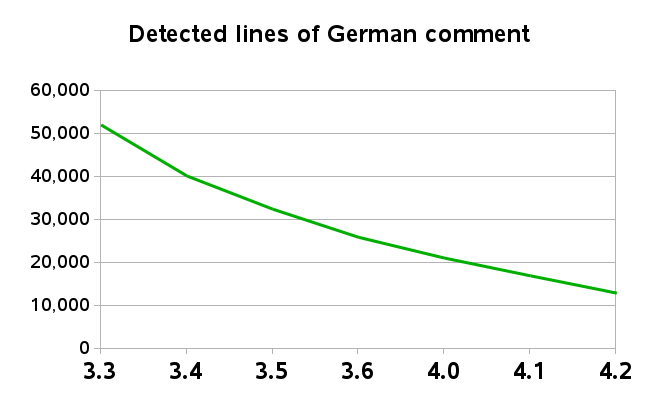 I suspect the tailing off effect is in part due to a rather substantial number of false positives in our language-guessing bin/find-german-comments tool. The windows build time was reduced by 10 minutes (10% or so) thanks to Bjoern Michaelsen (Canonical) and then promptly slowed down again by adding Link Time Optimisation into the mix for newer Microsoft compilers. Another much requested feature that helps users to provide excellent stack traces for Windows crashes and hangs, and thus debug / fix those much more rapidly is Cloph's Windows Symbol Server for release builds. Checkout how to get a backtrace - which is a wonderful way for users to provide better bug reports on that platform. Thanks to Fridrich Štrba (SUSE), Luboš Luňák (SUSE), and Christian Lohmaier (TDF). There is so much to say here, and it will be presented in much more detail shortly at FOSDEM. Suffice it to say that Calc has had a massive internal re-work, improving memory usage, performance in many cases, allowing the use of OpenCL to calculate some formulae on the GPU and more. Many thanks to Kohei Yoshida (Collabora), Markus Mohrhard (Collabora), and to the team from MultiCoreWare: I-Jui (Ray) Sung, Hao Chen, Shiming Zhang, Yiming Ju, Yang Zhang, Hongu Zhong, Ming Li, Min Wang, De Chuang, Feng Zheng, mulei, Xin Jiang, Zhenyu Yuan and more. Of course, we maintain a list of small, bite-sized tasks which you can use to get involved at our Easy Hacks page, with simple build / setup instructions. We now have a cleaner, and safer environment to work on improving the code. For example this video that shows how easy it is to get started in LibreOffice development these day. It is also encouraging to see how the Easy Hacks are progressing, lots of them are getting closed - could you close the 400'th ? LibreOffice 4.2 is the next in a series of releases that incrementally improve not only the features, but fundamentally the foundations of the Free Software office suite. Of course, it's only the first in a long series of monthly 4.2.x releases which will bring a stream of bug fixes and quality improvements over the next months. I hope you enjoy LibreOffice 4.2.0, thanks for reading, and thank you for supporting LibreOffice. Postscript: this item kindly translated to French. Mail chew - dispatched some windows builds. The great thing about Windows 7 is the way there are so many ways to shut-down, in my case simply running 'make' in two libreoffice build trees concurrently is enough: though there is an intermittent delay. Linux on the same hardware is like a rock. Plugged away at text, lunch, partner call, early dinner, back to work at slideware. Booked flights to the US for Tom's wedding in the evening. Up; mail chew, researched some of the great work done for 4.2.0. Worked through the TODO, call with David, sync. with Bjoern, call with Philippe, then Kohei, dinner. Worked late - built my own xf86-video-intel to see if I could rid myself of the SNA related crashers. Up early, to work, starting to sicken with some cold or other. Mail chew, slogged at windows build and chasing / reviewing last patches for an RC4 of 4.2.0 with Markus, Cloph, Michael S, Caolan, Eike, Kohei, Norbert and some other heroic testers. Lunch. Made some progress at last, nailed a few potential crashers and nasties that should never have made it this far. Encouraged that my CORBA knowledge transferred to COM's BSTR quite nicely, and what an appalling mess of string classes Windows truly is. Chat with Thorsten. Up earlyish, off to NCC with Jackie & Pete, played in the band; back for a fine lunch; set too at insulating H's bedroom - though ended up doing E's and M's as well to some degree; worked away at that until the evening. Put babes to bed, watched TV in iPlayer; bed. Up late, lazy morning, did some homework with N. H. out with O. for her first trip into town without an adult. Set too building some shoe-racks to fit under the hall settle (to try to restrain the four girl shoe mountain). Lunch, finished glueing & fixing with N. Watched a Scooby-do movie with the little girls. Back to poke at my windows build; joy of joys Windows 7 had decided to re-boot itself overnight, no build logs, and seemingly MSVC not working - or is it out of virtual memory while linking: a cryptic error message. Mail chew, Pete finished the carpet; chased a windows build issue: have to switch SATA cables every time I want to boot Windows, a malign side-effect of having installed Linux first I guess and Virtualisation being horribly slow (for some prolly graphics related reason). Ideas on how to persuade Windows 7 to boot from a SATA device it was not installed on without windows 'rescue disk' usage appreciated. Poked at a curiously hard to reproduce bug. Partner call, another partner call, dinner, read stories, sync. with ahunt. Left a LibreOffice 4.2.0 release build running on Windows. Up early, mail chew, stats crunching / building. Pete laying more carpet, J. had a hard time , worked on slides, ESC call, Advisory Board call, dinner, put babes to bed. Partner call late, bed late. Up early; practise with the babes, M's 'cello going well. Mail chew, admin piled on admin, Pete over to carpet the stairs, good stuff. Lunch. Partner call, TDF board call. Took M. to beavers and back, read stories; bed. Up; mail chew, textual fiddling, ESC bug stats building. Chewed away at mail most of the day, missed a dentist's appointment: annoying, setup more meetings, wrote and sent a pitch. Dinner with the babes. Bible study with Arun, good to catch up. Up; mail chew, sync. with Andras & Kendy, Muthu, Tim, 2x team meetings, action items, busy work. Helped Chris get some code documentation done when you're reading Dr Dobbs from 1993 to find examples something is prolly wrong. Dinner, put babes to bed; up late working with Kohei. Up earlyish, off to NCC to practise with the band; funky 30'th anniversary service, helped with kids work downstairs. Party shared lunch afterwards, tons of food, home after a bit; played with babes. Put them to bed, 'Bridge'-ness, and sleep. Up, breakfast with the family, played with babes variously, tidied up, read stories; thrilled to see Milan fix the Evolution attachment crasher biting me so regularly - what a good guy; build a new package with that to test. Lunch, out for a family cycle ride with Sue & Sophie, met Bronnie & Robin on the heath, caught up with them, home, pizza tea. J. out for the PCC Quiz & puddings night, read E. a story; LoTR with the rest, chewed mail briefly; bed. Up early; music practise with the girls, off into Cambridge, management meetings all day with Tim, Kendy, Tracie, Philippe, Rob etc. Encouraging stuff. Finally got to an interesting set of interview questions, and a great analysis / proposal from Jo. J. out baby sitting. Up early; off into Cambridge, great to catch up with Nat, albeit too briefly over lunch. Dug through mail, collected a few signatures while I was nearby. Partner call, ESC call, worked on slideware. Up early, admin, mail chew, ESC agenda buildage, lunch. Call with Tim Eyles, poked Andras, partner call, board call, more mail sync. with Tim. What a boring life full of admin. Continued to get repeats of the annoying Intel sna_accel.c driver crash which you can see here, frustratingly intermittent. Up early; into Cambridge, mail on the train; mgmt meetings all day. Train home, read stories to babies, dinner with Lydia & Janice. Pleased to get mail from Marc - an old friend building this fun < href="http://www.levelstar.com/">Android Braille Tablet which looks neat. Built stats. worked late on paperwork. Up early, mail chew, built misc. stats. Call with Tim, team call. Plugged away at the backlog of work on my plate, wrote a Linux Format column. Up late; off to NCC, Tony spoke, home for a Duck roast dinner for N. enjoyed that, and slugged much of the afternoon reading stories etc. put babes to bed, more of The Bridge. Up lateish; Naomi's birthday - much excitement and final present opening at breakfast. Prepped for a party later; took E. to a sleep-over-party, and got N's underway. David kindly came to help out with the fireworks, enjoyed catching up with him, bed late after getting sucked into The Bridge. Up early; to work, mail chew, sync. with Kendy, poked at Salesforce. Lunch with J. Admin, collected cards & receipts. Sync. with Tim, then Italo, and Jo. Slept on the plane, arrived late in the day, some hackery on the train to Newmarket, got my horizontal document iterator changes improved, wrote more twisted unit tests: "if it's not broke, it doesn't have enough unit tests yet." Finally home, to a car-full of babies needing a kiss, and the lovely wife; dinner, unpacked a little, amused by the BBC News from Elsewhere blog; bed. Up earlyish, a fine breakfast with the family, Nancy kindly dropped me in to the convention. Milled around as before, visited a number of interesting companies - caught up with Guy. Eventually gave up on CES and went back to E-mail, discovered that Collabora is a member of CEA sponsoring some quite compelling Bash the trolls advertising at CES - encouraging; also got lounge access to chew mail in and catch up. Off to the Cosmopolitan & to the airport, got stuck into mail & a bit of hackery - encouraging. Plane. Up earlyish; packed, checked out, bus to the show, wandered the floors - an excess of 4k displays on display [sic], lots of interest. Mail chew - and a bit of hacking to stay sane. Taxi to Ryan & Nancy's, another surreal experience of having to map-read / locate the address for a GPS-free Taxi driver. Had a lovely time, so great to catch up & see the kids grown huge and see how they're getting on: Mackenzie, Emma and Isaac. Fine meal, up late catching up on so much. Up early again; worked through the show programme to try to work out whom to visit. Tried to chew mail, stymied by an oddness with Evolution's imap folder bits; tried to diagnose & file a bug. Off for a practice at the convention center, kicked about there re-working the horizontal cell iterator for better performance. Enjoyed Lisa Su's presentation, and gave a hearty plug for the work we've been doing to HSA optimise LibreOffice calc - it's great to use the silicon more effectively: LibreOffice the code your APU loves to run. Played with some of the cool demos in the AMD tent eg. Oculus Rift, back to the hotel for some shut-eye; sync. with Curtis later. Built ESC bug stats. Up at 3am or thereabouts; poked at mail, did a bit of hacking, nailed a real stupid in the ZIP handling code, giving a nice save-time performance improvement. Off to the venue, met up with Eric from Adobe, nice chap; breakfast, met more of the AMD team, enjoyed the analyst / press pre-briefings around Kaveri and got some great insights into what we can do better from Phil Rogers. Caught up with the demos at AMD's booth with Manju & Raghu, onto CES Unveiled and the AMD party. Bed too early, jet-lagged. Up, packed, drove with the family to P. Risborough working in the car: a bit antisocial. Chewed through mail. Flight to Las Vegas for CES pre-briefings, arrived, checked in, on to a reception. Up, sync. with Markus, watched Dark Matter of IT Sync call with Kendy. Lunch. Calls variously with Curtis, Manju etc. Catch up with Kohei & Kendy. Up, mail chew, sync with Markus, profiling fun, some hackery. Sync call with Kendy. Up early; fine cooked breakfast, to work; cleaned up my Trapezoid subdivision acceleration code, wrote a unit test and pushed it; why we're doing that in LibreOffice instead of using XRender for Polylines I have no idea; need to dig out a good Windows profiler. Fixed a calc crasher; wrote a status report. Lunch. Back to dig out another unpleasant crasher, played with profiling on Windows: what that platform is badly missing is a rich open-source ecosystem. Bruce mended my wedding ring - with a bit of platinum solder, patched for now anyhow. Drove home. Back to work. Picked Thomas up from the station, up late catching up; lovely.